When you’re faced with a challenge, what do you do? Here’s a quick recap of how one ruler in ancient Judah responded to two different challenges. King Hezekiah, the king of Judah, lived in Jerusalem. His rule began roughly 715BC. He accomplished some great things in his lifetime, which you can read about here. But let’s focus on two unique challenges he faced. Hezekiah turned his face to the wall and prayed to the Lord, “Remember, Lord, how I have walked before you faithfully and with wholehearted devotion and have done what is good in your eyes.” And Hezekiah wept bitterly. Then the word of the Lord came to Isaiah: “Go and tell Hezekiah, ‘This is what the Lord, the God of your father David, says: I have heard your prayer and seen your tears; I will add fifteen years to your life. And I will deliver you and this city from the hand of the king of Assyria. I will defend this city. Awesome, right? God adds 15 years to his life AND he pledges to protect Judah from the Assyrians! So, I give the first challenge a pass. 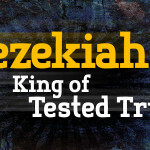 For all intensive purposes, Hezekiah was able to change God’s mind…which blows my mind. Does God change his mind? Can God, who knows the past-present-future really change their response to any of it? According to Isaiah (and other passages in the Bible)… He can and He does. But that’s another blog, another day. The second challenge was different. While the first challenge focuses on Hezekiah and his personal-well-being, the second requires more vision to see. At that time Marduk-Baladan son of Baladan king of Babylon sent Hezekiah letters and a gift, because he had heard of his illness and recovery. Hezekiah received the envoys gladly and showed them what was in his storehouses—the silver, the gold, the spices, the fine olive oil—his entire armory and everything found among his treasures. There was nothing in his palace or in all his kingdom that Hezekiah did not show them. When I read that, knowing what happens in 587 BC (BC counts down, AD counts up) to Jerusalem and the temple by a Babylonian King… I gotta say, this seems like a bad move. So, yeah. Bad move. If I heard this, I’d be distraught, just like he was when he was told to get his affairs in order because he was going to die. I’d pray a similar prayer and include some humility this time. Why was it such a big deal? Well, it’s assumed that the reason Hezekiah was entertaining the Babylonians was because they were striking some sort of treaty against Assyria… another world power that threatened Judah. But God had already promised Hezekiah that He would protect Judah from the Assyrians, so he did not need the help of Babylon. This was seen as a violation of trust. So, how did Hezekiah respond to this issue? This reveals what Hezekiah was most worried about. He was worried about looking good to his constituents. He was worried about whether or not there would be peace and security for the remainder of his life. He was NOT worried about the generations coming behind him. He was not worried about his nation after he was dead. He was not worried about the future… only the now. This is one of the things we deal with today. Are we concerned for the direction of our communities? Do we live our lives proactively to ensure we leave our communities in a great place for the next generation? Do we care about the challenges our grandkids and great-grandkids will face? What can do we about it anyway? … to be continued tomorrow.